Extra security measures are being introduced in Iraq ahead of Sunday's election - the first since the US-led invasion nearly two years ago. An extended curfew has begun to be followed by border closures and movement restrictions on Saturday. Insurgents, who have urged a boycott, killed four civilians in a car bomb in Baghdad on Friday as well as attacking polling stations across the country. Expatriate Iraqis were allowed to start early voting in 14 countries on Friday. A small US Army helicopter crashes in south-west Baghdad, two days after a helicopter crash in bad weather killed 31. 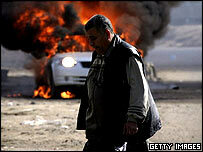 The tempo of violence appears to be increasing in the run-up to the poll, the BBC's Paul Wood in Baghdad says. The violence has led to many candidates campaigning without revealing their names. Our correspondent, who accompanied two candidates in Baghdad as the campaign drew to a close, says people are taking the threats seriously. In many places, insurgents carried out mortar, rocket and bomb attacks against polling centres. For this reason the location of most polling stations remains secret, even as the ballot boxes are distributed by the security forces, our correspondent adds. Hundreds of police are being deployed to enforce the extra security lasting three days around Sunday's election. 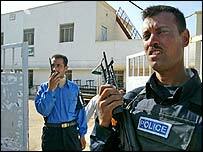 These include closing Iraq's borders, the Baghdad international airport and the banning of civilian vehicles on election day. A US general in Iraq has been quoted as saying that the multinational force will expand its combat power on the streets by one third to try to make the elections safe. Sunni insurgents told Iraqis on Thursday to boycott the polls, a day after President Bush urged voters to "defy the terrorists". The minority Sunni community dominated Iraqi politics during the regime of Saddam Hussein. But the election is expected to lead to a power shift in favour of majority Shia Muslims. Sunday's vote will be supervised by 828 international monitors, with a number of foreign embassies providing staff to act as monitors, too. The expatriate vote is running from Friday to Sunday. About 280,000 people in 14 countries - from Australia, the Middle East, Europe and North America - may take part. Some decided not to participate amid fears of possible persecution against themselves and their relatives still living in Iraq, community leaders say in Australia. Iraqi nationals are also voting in Jordan, the United Arab Emirates, Syria, Turkey, the United States, Britain, Canada, Denmark, France, Germany, the Netherlands and Sweden. You can watch John Simpson's Panorama programme on the state of Iraq on BBC One on Sunday 30 January at 2215 GMT and on BBC World on Saturday 5 February at 0810, 1210 and 2210 GMT.